Important: These are not directions for making this trick yourself. These are the directions that came with this trick, when it was on the market in the early 2000s. This PDF is for collectors who may have the prop, but no directions, magic historians, and those simply curious as to how this trick was done. The trick still shows up on eBay, magic flea markets and auctions. This was released in both jumbo and poker size cards. These directions apply to either version. After the laughter subsides, the performer says, "I thought you'd be more impressed." He turns the faces of the cards toward the audience and spreads them from hand to hand revealing ALL THE CARDS TO BE JOKERS. This surprise ending never fails to get laughter and good applause. 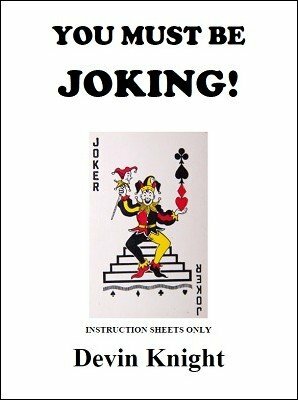 All in all, you will find this to be one of the most commercial card tricks available.